This entry was posted in Bliss Tips, My Backyard, Nature, Photography, Wildlife and tagged ducks, golden retriever, golden retriever puppies, MaryALivingston, retrievers by MaryALivingston. Bookmark the permalink. that photo – and your narrative – reflect pure joy! 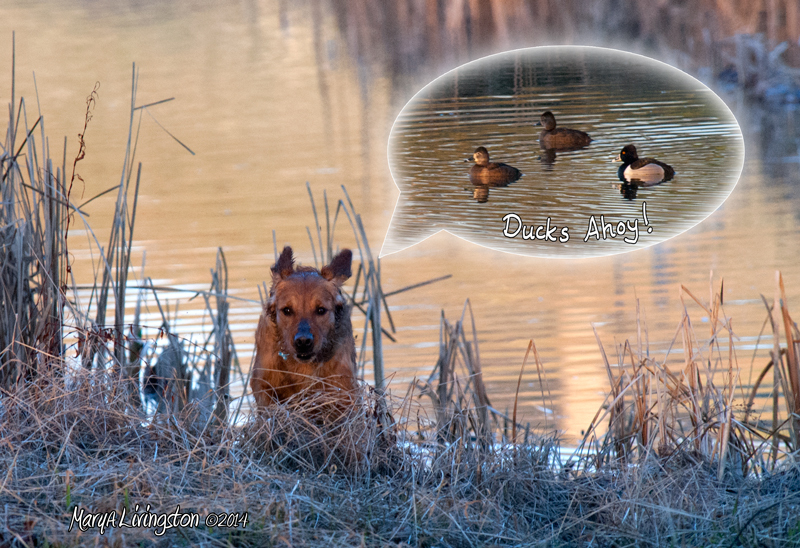 I really wanted a shot of them all in the same view…but the ducks weren’t hanging around…and Sailor wasn’t slowing down. So much fun! yes, it would probaby be difficult to get them to sit-stay with the ducks distracting their attention as well! Junior retrievers are easily distracted. When retrievers are tested at this age, they are on lead, because sometimes they just can’t contain their enthusiasm! Young Kinta is more steady than Sailor, but he knows us more. Sailor is still figuring us out. So is Sailor with you to stay – forever? Well, happy JOY for all of you!! Great poster idea for a kids room and enjoyment for all. Well captured! I admire your “tricks” with the added conversation. With all the enthusiasm, it’s hard not to imagine the conversation. We have a new puppy! A really big puppy! Just wait ’til he fills out. He is a joy and a wonderful addition to our home. He’s the 23rd dog we’ve welcomed into our home over the last 30 years. Wow, sounds like a lot now that I type it out. Us too…we have close to that and loved each and every one!